The overland transporter is moved into position below the space shuttle Endeavour not long after the orbiter was demated from the NASA 747 Shuttle Carrier Aircraft (SCA) during the early morning hours on Saturday, Sept. 22, 2012, at Los Angeles International Airport. LOS ANGELES — Space shuttle Endeavour, now a permanent resident of the state of California, has traded its winged chariot for a set of custom wheels. Early on Saturday (Sept. 22), the shuttle was hoisted by cranes off the modified Boeing 747 jumbo jet that flew it to a landing at Los Angeles International Airport (LAX) the day before. Endeavour's touchdown, which was preceded by a flyover tour of the state to the delight of millions of spectators, was the final airborne leg of the orbiter's delivery to the California Science Center (CSC) for display. Next up: a road trip. 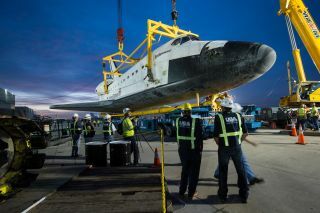 To prepare Endeavour for its 12-mile (19-kilometer) parade through the city streets of Inglewood and Los Angeles next month, NASA's team first had to remove the orbiter from the back of the Shuttle Carrier Aircraft (SCA) and then load it onto a modified overland transporter. Using a very similar, two-crane contraption to what was deployed earlier this year to hoist sister ship Discovery and the prototype Enterprise from the same jetliner after their ferry flights to Washington, D.C., and New York City, the 155,000-pound (70,000-kilogram) Endeavour was carefully raised so that the aircraft could back away and the transporter could drive in underneath. The shuttle was then lowered on to the wheeled platform. The air- and- spacecraft now separated, Endeavour will move into a United Airlines hangar to be further prepared for its transport and display. The SCA meanwhile is scheduled to make its final flight on Monday (Sept. 24) to NASA's Dryden Flight Research Center at Edwards Air Force Base, Calif., where it will be grounded and become a parts donor for NASA's SOFIA airborne astronomical observatory. Inside the hangar, technicians will remove from Endeavour's aft the aerodynamic tail cone that was added for its ferry flight from Florida, reposition the shuttle's replica main engines from their tucked-for-flight orientation and install nozzles on the orbiter's maneuvering system pods. They'll also enter Endeavour's crew cabin to configure it for the science center's curators and retrieve from inside thousands of embroidered patches that were flown on Endeavour for the ferry flight at the center's request. On Oct. 12, Endeavour, riding the same transporter that was previously used to move its sister ships between their Palmdale, Calif. assembly plant to Dryden for ferrying to the KennedySpace Center in Florida, will emerge from its temporary airport hangar home and roll out onto the streets of Inglewood. The procession will pick up in earnest the next day, when the space shuttle is moved in full public view from Inglewood City Hall to the California Science Center at Exposition Park, where it's expected to arrive by dusk. Along the route, Endeavour's delivery will be celebrated by a musical dance and aerial performance choreographed by famed actress Debbie Allen. Before arriving at the CSC, the towing duties for the space shuttle will be turned over to a Toyota Tundra pickup truck as part of a partnership and sponsorship to raise upwards of $500,000 for Endeavour's permanent display. At the CSC, the shuttle will be exhibited atop the transporter inside the temporary Samuel Oschin Space Shuttle Endeavour Display Pavilion, a large hangar that was recently built beside the center's main building. Ultimately, the CSC plans to position Endeavour on a recreation of its launch pad, complete with twin booster and external fuel tank, inside its planned Samuel Oschin Air and Space Center to be ready to begin inspiring visitors by 2017.